This is the time of the year in Formula one when the phoney war is underway with “new cars” being rolled out for the media at high profile events. The sponsors love it, of course, as the press and TV usually show the new cars with the sponsors’ logos prominently on display! But we haven’t in the past learned much about what is really going on. This year, however, we do at least have cars that will be radically different from the 2005 models because the car technical regulations have changed with the most significant alteration being that engines size has been reduced from the previous 3-litre V10s to 2.4-litre V8s. The FIA says that the aim is to “reduce costs and improve safety” and that this is “likely to add around three to five seconds to lap times at most circuits”. All the teams will have been working hard to in the short time that they have available between the end of last season (16th October 2005) and the first event of the 2006 season in Bahrain on March 12th. For Ferrari it is no exaggeration to say that this is a crunch season and that a good start is essential. It is difficult to learn much from the Scuderia’ s public pronouncements but Michael Schumacher was realistic when he said that whilst his initial impressions of the new car are positive there is much work still to do before the first race. In 2005 Ferrari was overtaken by both Renault and McLaren but whether the principal cause of this loss of competitiveness was their problems with the Bridgestone tyres, or whether there was a more comprehensive slippage technically is still not clear. 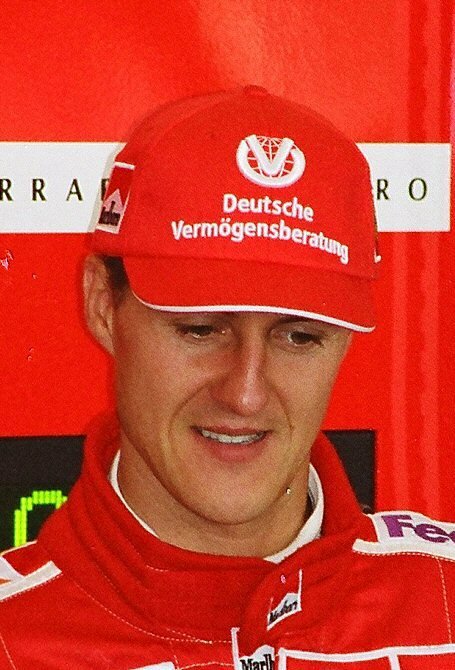 There is also (whisper it softly) the probability that Schumacher is not quite the driver he was, certainly when compared with Fernando Alonso and Kimi Raikkonen who are respectively, thirteen years and eleven years younger than the German maestro. Formula one is by far the world’s most complex sport – not just the technical rules but the “sporting regulations” (a mere 35 pages) can be a minefield through which the teams must pick their way in order to ensure that they comply. I would not be surprised if the extent of the changes this year means that we have some early disputes and even disqualifications as some teams try and get an edge by interpreting the regulations in their own ways. Ferrari’s experience might be a telling factor here and their cosy relationship with the sport’s administrators may help as well. Certainly Ferrari has nothing to complain about in respect of both the timing and the nature of the 2006 rule changes. In particular the fact that in race tyre changes will again be permitted this year favours Ferrari and will have helped Bridgestone get their tyre package more competitive for this year. All things are never equal in Formula one; there are too many variables at play for the overall performance of the top teams to be predictably similar. The margins between success and failure are so minute that one team’s car can be the equal of another’s in all respects except for one. This is where the “driver factor” plays a crucial part and where, in the past, Michael Schumacher has made the difference. He has won races and even championships in a car that was sometimes not (quite) the fastest or the most reliable, and he has performed better than anyone else in difficult race conditions - especially when the circuit is wet. But last year even he could not find a way to compete with Renault and their brilliant driver Alonso and it must be the Spaniard who is again the favourite this year. But never write Schumacher off. The best driver of all time was first world champion at the age of 25 in 1994 and it does seem that he still has the self belief that he can still hack it with the new much younger stars. History suggests that age need not be a barrier (Alain Prost was 38 when he won his last championship and Nigel Mansell a year older when he won his in 1992). If the Ferraris are the technical equal of the McLarens and the Renaults this year we will have that most delicious of sporting contests between a “good old ‘un” and a couple of “good young ‘uns”, a mouth-watering prospect! There is an established tradition that the major international sporting tournaments take place at four yearly intervals. This no doubt originally stemmed from the modern Olympic Games which (since 1908) have been celebrated every four years (except when wars have intervened). The first football World Cup was in 1930 and has also followed the four year gap principle, as has been the case for Rugby, and Cricket has also now settled into this pattern. Other international tournaments fit in with these schedules (in Football, for example, the European Championship) which means that sports fans will have at least one big tournament every year and also that the organisers of these huge sporting festivals have time to get everything in place. But there is nothing cast in stone about a quadrennial pattern for sport and it may be that for cricket it is time for a change. This column has commented on the problems that the International Cricket Council (ICC) is currently having with Indian cricket, problems which, it is fair to say, are mostly of their own making. One of the things that the Board of Control for Cricket in India (BCCI) is concerned about is the ICC’s percieved need to fit in an “ICC Champions Trophy” whenever it can. This “Turkey of a tournament” (as Wisden has called it) has been beset with problems from the start and it is not surprising that the Indians want to get rid of it for good. They are right to do so. The BCCI’ s main gripe with the ICC is that not only are they being forced to play too many meaningless matches against weak opposition but also that they are expected to commit their One Day team to largely worthless tournaments (like the Champions trophy) at the ICC’s behest. The BCCI wants more control over their own fixture list, an ambition that most of the top cricket nations will share. On one thing, however, the ICC is right and that is that there does need to be a structure to international cricket fixtures. Not the structure that they currently have in place, for sure, but some sort of structure. For Test matches there is a need to achieve a balance between the money spinning series (such as the “Ashes” and other series in England against the top nations, the India v Pakistan matches and the Border-Gavaskar trophy) and those Test matches which do not generate huge revenues (most of the rest). And, of course, there is a need to have the big money One Day matches in some sort of arrangement which, whilst establishing a regular schedule for contest between the top nations (e.g. India v Australia), also allows the smaller nations the chance to play against the best. The ICC’s affection for the “Champions Trophy” is because this tournament is their only significant source of revenue (which comes mainly from sponsorship) other than the Cricket World Cup (also the ICC’s property). So to continue to finance their development programmes (not least the planned cricket academy in Dubai) they need to keep the cash coming in. How can they do this and also re-establish an effective working relationship with the BCCI and other national cricket boards? Well they could start by rethinking the scheduling of the Cricket World Cup. If the cricket world thinks out of the box for a moment then they should see that there is nothing sacrosanct about the quadrennial programme for the World Cup. Just because other sports follow this schedule that, in itself, is not a reason for cricket to do so. If the “Champions Trophy” is abolished, as surely it must be, then why not play the World Cup more frequently? Every two years would be too often and devalue the tournament, but why not schedule it to take place every three years? From the ICC’s commercial perspective this would mean that over time they would increase their revenues substantially and sponsors would be delighted that their brands are on display at a meaningful tournament more frequently. The smaller nations would welcome the chance to compete at the top level on a more regular basis. And public interest would be held because the World Cup clearly matters, whereas other more artificial tournaments matter less. It would also mean that the tournament came round to all the main cricket nations rather more frequently than at present. Theo Walcott is a young footballer presently playing for the English club Southampton who is seen as having extraordinary promise. Like the teenage star Wayne Rooney before him Walcott will be a multi millionaire well before he comes of age in two years time. Indeed his financial future will be secure long before he has actually achieved anything in the game as the big clubs (with Arsenal the favourite) compete with one another to sign him. The deal they offer will comprise a huge transfer fee to be paid to Southampton and a salary package for the young man which will ensure that he need never worry about money for the rest of his life (even if his football promise is not a reality when he has to perform at the highest level). It would be churlish not to wish Theo Walcott well. But I can't help feeling that rewards should somehow be based on performance rather than potential. Remember that Henry Ford once said that you "Can't build a reputation on what you are going to do". Promise has to be fulfilled to be a reality. The same debate could be made around another British sports star the Formula one drive Jensen Button. Button is rich beyond the dreams of avarice and yet these riches have been acquired not because he has been a great driver, but because teams managers think that he might one day be one. Remember that Button, now in his sixth season in Formula one, has yet to win a Grand Prix! Perhaps I have an over puritanical view that reward in life should be a reflection of achievement. In the world of professional golf, for example, where there certainly have been some examples of players who have got rich on promise rather than success, in the main pros have to work very hard (and be very good) to achieve the mega money being thrown at Walcott or Button. If you look at the prize money at an average PGA event you will see huge prizes for the top five or six finishers. But go down the list and you will notice that even if you make the cut in most events you are not really even guaranteed a prize that will cover your costs. Play badly in any one week and you don't earn anything. The journeymen pros on the big tours in the USA and Europe can make a decent living out of the game, but they usually need one or two top five finishes every year to prosper. The same applies in professional cricket. Play regularly in an international side and you will make good money (and if you are an icon like Tendulkar, Lara, Warne or Flintoff very good money indeed). But your average pro in the County or the State game is likely to be paid very modestly indeed - they really do often play for the love of the game, not its rewards. It is naïve to think that in the world of today's professional sport money matters are not all pervasive. Too often the actions of sporting administrators, competitors and teams are in stark contrast with the moral principles of the sport. In recent times we have had the illegality of drug abuse, match fixing and cheating in too many case to mention. And we have also seen too often unbecoming on the field of play behaviour by multi-millionaire stars (abuse of opponents, challenges of officials). But when we charge these miscreants with bringing their sports into disrepute (which they do) should we not also be looking at the actions of those who allow conditions to be created within whom these abuses can occur? Many sports have created reward systems which involve so much money that, whilst this does not excuse inappropriate behaviour by players, it does explain it. Rewards should be more closely linked to performance, rather than promise, and the penalties applied to those who break the rules should be more stringent than sometimes they are. And those who administer sport should behave rather better themselves! Then we might have a world in which sports and sportsmen would set a better example to young people than that set by a foul-mouthed millionaire teenage footballer, a perfomance-enhancing drug taking athlete or a cheating cricketer claiming a catch when the ball has grounded. I am not sure whether those clever people who study human DNA have found the sporting gene, but I am sure that it exists. It is that part of every individual’s genetic make up which determines their sporting prowess and, like most aspects of human ability, it is present to a greater or lesser extent in all of us. I have been thinking about this phenomenon recently in relation to the game of golf (and my continued pathetic attempts to reach even a respectable level of proficiency). I have come to the conclusion that it is all very unfair because those lucky people who have the gene can apply it to almost any sport. So good cricketers and tennis players are almost always good golfers and so (rather less logically) are good footballers. And those of us of more modest sporting abilities are modest at every sport we try - if only (we think) we good be good at just one sport that would be fine! But whether it is golf club, cricket bat, tennis racquet of football we can’t really hack with any of them! Will, an old school friend of mine, has the sporting gene in abundance – he was effortlessly good at every sport he tried. I saw him again after a gap of many years quite recently at a corporate golf day. Now Will has always been a bit of an eccentric with what, I think, we now politely refer to as an “alternative lifestyle”. He is rather good at not conforming and it is always amusing to see what his latest minor rebellion against convention will be. At the golf day, held at rather a snooty Home Counties golf club, Will arrived in the car park astride a large and very noisy Harley-Davidson! 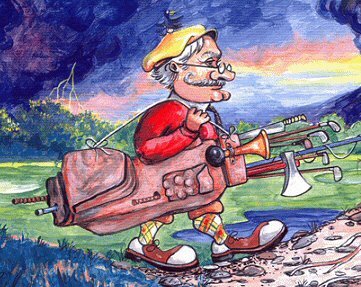 Now the quick thinking amongst you will notice a potential problem with this mode of transport – it is not ideal for carrying your golf clubs! Whilst the remainder of us were unloading our clubs, trolleys and other equipment from the boots of our saloon cars we noticed that Will had a rather dirty canvas bag slung over his shoulders on the bike. On closer inspection the bag contained a putter, a wooden driver of uncertain vintage, a wedge and a couple of other ancient irons with hickory shafts. They were all about fifty years old, or more. On the first tee three of us took a few practice swings with our state of the art Callaways, Taylors and Pings before hitting drives of varying degrees of ordinariness down the fairway (or in my case into the rough). Will then took his ancient driver from his grubby little bag and hit a drive of unerring accuracy two hundred and seventy yards down the fairway which he then followed with an exquisite wedge shot hit high into a bright blue sky from which it descended 6 feet away from the hole for a birdie. The moral of this tale, of course, is that in golf talent will always out and the equipment doesn’t really matter that much if you have talent in abundance. This fact doesn’t stop even the top professionals from trying new equipment which might give them an extra yard or two or help them cope better with a touch of jitters on the green. But most pros could regularly break par with a bag of clubs like my friend Will’s and with an old rubber-core ball. This brings me to the subject of golf ball technology and the detrimental effect that advances are having on the professional game. In 1980 the leading driver on the PGA tour hit the ball an average of 274 yards. In 2005 the top driver averaged 319 yards with money leader Tiger Woods in second place with 316 yards. The golf ball is, of course, only one of the factors in this increase but it is increasingly becoming one of the most important. Manufacturers now have a far greater understanding of golf-ball aerodynamics than in the past and they are able to use this knowledge, combined with new materials and manufacturing methods, to make balls which go further and further. Good news for the good amateur perhaps (although for the hacker like me it could mean only that my ball goes further into the rough). But is this really desirable in professional golf where golf courses regularly have to be lengthened to cope with these changes? As published in "The Bahrain Tribune"
I am unlikely to be an apologist for, or a natural supporter of, the Board of Control for Cricket in India (BCCI) described in the 2005 Wisden as one of the “worst [cricket] administrators in the world”. 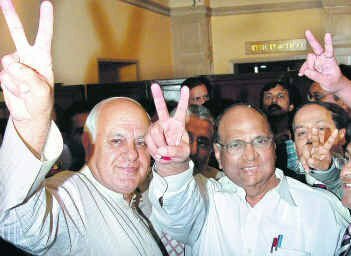 But with the departure of Jagmohan Dalmiya and the accession to power of Sharad Pawar and Lalit Modi it does seem that the Indian cricket scene is changing very rapidly. One of the consequences of this is that the International Cricket Council (ICC) will be in for a hard time as the BCCI flexes its muscles and challenges their authority. This can only be a good thing. The substantive issue which has raised the temperature between the BCCI and the ICC is the international fixture list; the BCCI wants greater control of when and where the Indian team plays. They want fewer meaningless fixtures against the minnows of Bangladesh and Zimbabwe and more lucrative matches against the top cricket nations. Bilateral talks have already taken place with Cricket Australia and are planned with the English Cricket Board and others. To understand the underlying factors behind these developments we need to comprehend why the ICC is worried, it is all about power and money! Although superficially the ICC is all powerful in world cricket in reality this power is built on very shaky foundations. In essence the ICC owns the Cricket World Cup, but very little else. Virtually all of the ICC’s income is generated from sponsorship of the World Cup which is why they keep such a tight control of this tournament and its exploitation. It is also why the ICC promotes other events to try and augment the income stream from the World Cup. These events have been unmitigated failures. The ICC Champions Trophy was described by Wisden as a “Turkey of a tournament” and as one of the “Great Sporting Fiascos of our time”. Similarly the ICC’s other event, the so-called “Super Series” involving Australia and a Rest of the World team, was a disaster with poor crowds and lousy one-sided cricket. The ICC’s other big idea is their “Test Championship” and “One Day Championship” tables. These tables purport to show the rankings of all the international teams in Test matches and One Day cricket, but it is only the ICC who sees these tables as anything other than mildly interesting. When England played Australia last summer they were not playing to improve their positions in the ICC’s table, they were playing for the Ashes. Similarly when India plays Pakistan later this month it will not be the effect of the results on their position in the championship tables that will be uppermost in the teams minds! Any table of this sort is going to be arbitrary - change the rules and you change the positions. The tables are not valueless, but they are a consequence of results not the driver of them. The ICC’s affection for its tables is partly because they seek to make sponsorship money from them and partly because it allows them to try and dictate fixture schedules. And this is the nub of the problem between the ICC and the Indian Board. The BCCI in its new guise has realised just how powerful a product Indian cricket is. Lalit Modi has called it the “number one sports brand in the world” and the “number one sponsored team across all sports”. Given this they want control over when and where India plays and they don’t want the ICC interfering by trying to make them play meaningless fixtures against weaker teams at inconvenient times and with low income generation potential. There are risks inherent in what the BCCI is trying to do, not least the danger of lower interest Test cricket being pushed aside to allow more and more One Day Internationals to be played, but the BCCI has a strong case. Last year India played 21 ODIs but of these a ludicrous 10 were against Sri Lanka and a further 5 were against Zimbabwe and New Zealand in the meaningless Triangular series in Zimbabwe. Not one ODI was played against Australia, Pakistan or England over the whole year. Indeed India has not played World Champions Australia in an ODI for nearly two years (apart from one rained-off exhibition match in Holland). This is clearly absurd and something that the BCCI is determined to put right and if they take on and beat the ICC on this issue quite a few of us will cheer!